During July–August 2007, a small-scale salvage excavation was conducted at Horbat Mesar (North; Permit No. A-5211; map ref. NIG 204343–66/705744–66; OIG 154343–66/205744–66), prior to the construction of a residential building in Meisar village. The excavation, on behalf of the Israel Antiquities Authority, was directed by A. Massarwa (photography), with the assistance of R. Mishayev (surveying and drafting) and M. Peilstöcker (scientific consultation). The excavation was conducted along the northwestern slope of the hill where the Meisar village is situated. Remains of buildings, agricultural installations and a bathhouse from the Roman and Byzantine periods had been exposed in previous excavations nearby (HA-ESI 113:39*–40*; HA-ESI 120; Permit Nos. A-3602, A-3925, A-4787). Two half squares (A1, A2) were opened, 10 m apart. Square A1, which was excavated down to virgin soil, yielded sections of two walls (W10—length 2.26 m, width 0.4 m; W11—length 1.17 m, width 0.5 m), which formed the corner of a room and were preserved a single course high, below a layer of fill (L300). 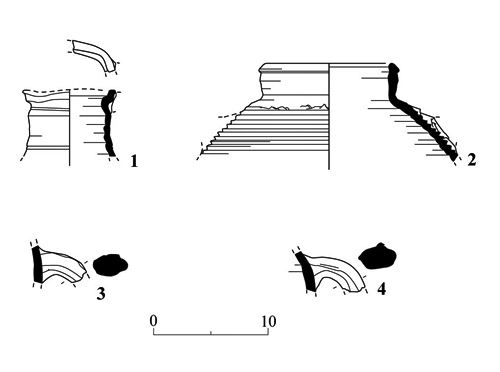 Wall 10 was built of ashlar stones (average size 0.15 × 0.40 × 0.60 m) in dry construction, while Wall 11 was built of roughly dressed stones (0.20 × 0.35 × 0.50 m). 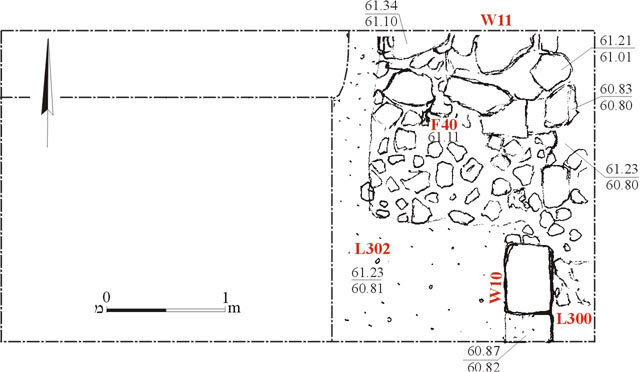 A fieldstone floor (L40) that was founded on soil abutted the walls. Jar fragments dating to the Byzantine period (fourth–sixth centuries CE) were found in the fill between the stones in the walls and below the floor.